Christmas is usually a busy time for us trying to find a suitable present for friends and loved ones. Something unique, something they don’t already possess, and most importantly, something you know that they are going to like and use! So to make things just that little bit easier this year Innokin will be launching a new range of products throughout the month of November that should fit nicely into the Christmas stockings of current smokers who are looking to quit (partners please take note) and, of course, the seasoned vaper. These include the Endura T18, Cool Fire IV Plus, the Disrupter TC (can’t wait! ), and their new Ni-200 Coils. The Disrupter C50 is a VV/VW device that will get your attention if it hasn’t already done so by now thanks to a revolutionary design and ingenious, hot, swap-able revolutionary Innokin 2000mah Cell. This comes in a variety of seven interchangeable colour schemes plus three separate control units. I mention this as you can purchase the control heads and batteries separately with the possibility of making twenty-one different colour combinations, which should be more than enough for the majority of us! Firing down to a minimum resistance of 0.2ohms and from 6 watts up to a maximum of 50 watts with a variable voltage range between 3 volts and 7.5 volts, the C50 is a well specked and a very user-friendly device, in a size that sits midway between the CoolFire IV and the iTasteMVP. As a Company that regularly advocates on behalf of the vaping community, they have also launched a Limited Edition U.S.A badged Innokin Cell C50 with a percentage of the proceeds being donated to casaa.org. I will be running a prize giveaway starting on the 17.11.15 and ending on the 30.12.15 on my Facebook Page with two of the Limited Edition Vaping Advocacy Disrupter Battery Cells up for grabs. Plus, One bottle of Juice for each of the lucky winners kindly donated by Villain Vapors. I will pick two winners from the entrance on the 01.12.15 and send out in time for Christmas! THE VAPE ON WATT SUPPORT BILL H.R 2058 INNOKIN D50 DISRUPTER CELL GIVEAWAY. I did not have the time to review the Disrupter when it was initially released. However, I felt it was my duty to do so to show my support to the Citizens of the United States, along with the manufacturers & retailers who are on the verge of losing their right to vape along with their businesses under the proposed deeming, and potentially harmful regulations. Optional Limited Edition Vaping advocacy Edition Disrupter Battery. Remembers last Voltage or Wattage setting Ohms Meter & Battery Level Indicator & Puff Counter. Unique Identification Number with Online Verification. 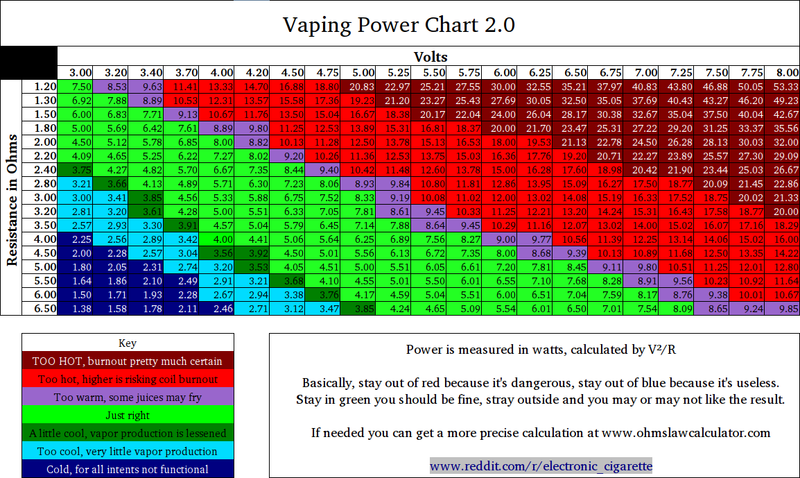 I have used the ranges supplied in this chart for overall consistency, but I have also tested the Innokin C50 Disrupters full power output from 6 watts up to its maximum of 50 watts using the iSub Apex and iSub G with E-Liquids supplied by Villain Vapors. Innokins R&D team appear to have gone all out with this latest advanced personal vaporizer, so let us take a closer look at its features and functions. To create maximum connectivity with the attached atomizer, they have incorporated a flush mounted stainless steel 510 connection with a gold plated spring loaded positive pin. The Disrupter includes new and significantly improved highly quality durable Japanese manufactured buttons with a smooth and very tactile feel to them which is the best I’ve personally used on any device so far (Brilliant). As this is the most used part of the human interface, it is so important to get this part just right so Innokin claim that they have been tested to over 100,000 clicks that are a testament to their build quality and longevity. The Power/Fire button also includes a battery status indicator around the outside of it so you have a visual reminder of when the cell needs charging or replacing with another colour option! Depending on the screens orientation the Up/Down arrow indicators work in opposite directions which is just a little confusing to begin with. However, the screen will display the same layout with the battery level indicator always placed on the right-hand side. So, my advice is to choose which one happens to suit you best and stick with it. Personally, I prefer the Left arrow down (decrease power) Right Arrow Up (increase power) as it seems more logical? The OLED screen is the same clear bright display that we have come to love from recent Innokin products that show your current resistance of the attached atomizer, Voltage, and Wattage, plus the current battery state. It will also display any warnings, so please pay attention to this and read the included user manual for further details should they appear. The Disrupter includes a LiPo replaceable battery cell that Innokin claim maintains full 2000mah capacity with over 300 full charge cycles, and with a max continuous output of 20 Amp even at its maximum of 50 watts the Innokin Cell should last longer and produce plenty of output power for its size. Originally designed for newcomers who are unaware of the dangers associated with batteries the Disrupters cell was developed specifically to provide a safer, smarter, and longer lasting alternative to the current power solutions that are available like the 18650. And with the integrated smart-PCB you will also get an additional set of safety features that includes overcharge protection, overheat protection, short circuit protection, and auto-shutoff. Charging the battery is achieved via the standard Micro USB at the base of the cell. They have also included a Tri-LED touch power indicator button just above it that when pressed will show the batteries current charge level. So with three options provided to check the battery level, and a quick Slide and Lock system you should, in theory, never run out of charge or colour options! First, attach your filled atomizer via the 510 connector (22mm diameter maximum recommended). To turn on the Disrupter C50 connect a fully charged Innokin cell and press the Fire/Power button three times. To turn the device off press Fire/Power button three times once again. This serves as a quick locking function as well, which helps to keep the operation of the Disrupter as simple and straightforward as possible. The screen will first display the words Innokin Technology including the Company Logo followed by the main operating window. You will see the resistance of your attached atomizer shown in the top left-hand corner and below this either the voltage or wattage value depending on which mode you have chosen to use. This will be displayed in the centre of the screen with larger numerical values with the letter V(volts) or W(watts) next to them and to the right. The currently displayed value can be altered by using the up and down buttons to set your personal preference. On the far right-hand side is the current battery charge status of the attached cell with an accurate and true indication of how much charge you have left. Switching between either, VV and VW modes is achieved by holding down the Fire/Power button and the UP button simultaneously to change from VV mode to VW mode. Or, the Fire/Power button and the Down button to switch from VW mode into VV mode. By holding down the UP & DOWN buttons together, it will display the included puff counter that is reset when the device is turned off. Continuing to hold down the UP & DOWN buttons after a few seconds will allow you to change the orientation of the screen itself providing two possible options to suit your preferred choice. Initially, I was somewhat sceptical as to how well the Disrupter C50 would fit into the current range. Especially after such a successful launch of the CoolFire IV which as I said at the time in my review was the most aesthetically pleasing and best-designed device since the introduction of the much famed VTR, for me personally anyway. What I have come to love about this device and failed to miss when it was first launched is the increased lifespan that it has to offer over its predecessors. With the ability to swap out the battery should it fail and still have continued use of the control unit whilst only requiring a new cell to continue using it. Plus, the additional advantage of creating a new look thanks to the plethora of colour options available to you. So I’m pleased I finally had the chance to review it, and for a very worthy cause too. There is very little that you’re going to find which will persuade you from not investing in the Disrupter C50 technology. Vapour performance is excellent with great flavour provided thanks to the Japanese Organic Cotton coils, and of course, Villain Vapours Premium Elixirs. Three points worth noting are 1, the maximum diameter of 22mm for your atomizer. Anything larger will require you to remove it if you need to swap out the battery cell. And 2, the battery cell needs to be changed from the bottom, not the top, allowing me to remove points one and two from this review! And 3, A smooth top to make it just that little bit more aesthetically pleasing. And don’t forget, the Grandfather Clock is ticking, and ticking fast. So, SUPPORT the casaa.org. and help protect your right to VAPE! Expected price range appears to be around the £50.00 or $65.00 for the Disrupter C50 and £20.00 $25.00 for additional cells. For further details on the Innokin Disrupter C50 or any other Innokin product, please visit the Innokin website or contact your local brick and motor store. Thanks to Innokin for providing the Technical specifications for this review and Images of the Disrupter & Apex Tank. And a very big thank you to Chris and the team at Villian for their unwavering support and generosity. And finally, this is what happens if you fail to review a product when it’s first released!! !